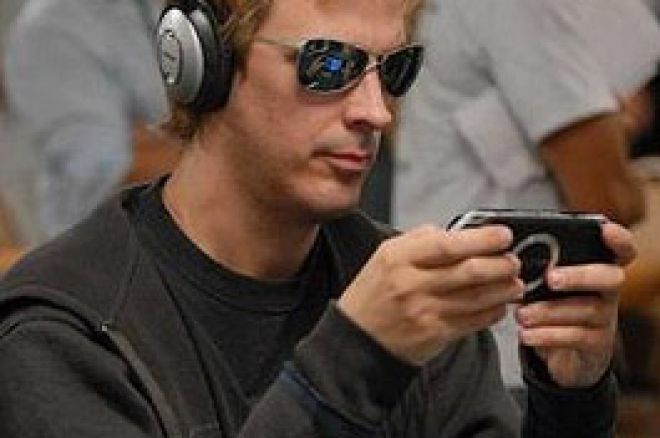 In what is being touted as the "First Man-Machine Poker Championship," Phil Laak and Ali Eslami will compete for real money against Polaris, a poker-playing computer program developed by a research team at the University of Alberta. The match will take place July 23 and 24 at the Hyatt Recency Hotel in Vancouver, Canada as part of the annual meeting of the Association for the Advancement of Artificial Intelligence (AAAI). The game will be fixed limit Hold 'em. Laak and Eslami each will play four separate 500-hand sessions against Polaris, two on Monday and two on Tuesday. In order to minimize the luck of the draw, each session will be constructed as a "duplicate match." Thus the cards Laak receives will be identical to the ones dealt to Polaris versus Eslami, while Eslami's cards will be the same ones dealt to the computer program versus Laak. The community cards will be identical as well. The pair will compete simultaneously in separate rooms against copies of the Polaris program, and thus will not be permitted to communicate while the matches take place. Nor will the two copies of Polaris be able to "communicate" with each other. At the end of each session, the humans' chips will be tabulated and compared to the number earned by the two copies of Polaris. If Laak and Eslami together accumulate 25 small bets or more than does Polaris in a session, they will split $5,000. If a session ends with either the humans or Polaris winning by less than 25 small bets, that session will be declared a statistical tie and Laak and Eslami will together earn $2,500. If Laak and Eslami manage to take down all four sessions by 25 small bets or more, they will split a $50,000 prize. This won't be the first time Laak has represented the human race against a computer in a test of poker skills. In July 2005, Golden Palace sponsored the World Poker Robot Championship in which six different teams of programmers competed for $100,000 and the right to challenge Laak. The winning program, Poker Probot, authored by software engineer Hilton Givens, also defeated a program developed by the University of Alberta team in an exhibition match. Poker Probot then took on Laak in a competition held at Binion's Horseshoe Casino. Spurred on by an audience's chant of "humans, humans," Laak defeated Poker Probot in a battle lasting three hours and over 300 hands. In July 2006, the Alberta group came back to win the first AAAI Computer Poker Competition at the association's annual meeting in Boston. The research team is led by Jonathan Schaeffer, who chairs the Computing Science department at the University of Alberta. Schaeffer is best known for having authored Chinook, a checkers-playing program that first began competing against the world's elite checkers players in the early 1990s. After 18 years of development, the Alberta team announced just last Thursday they had finally "solved" the game, meaning they have created a program that will necessarily choose the best possible move in every situation. This result came after hundreds of computers had been employed to analyze 500 billion or so possible board combinations. Do researchers hope similarly to "solve" poker? Or at least fixed limit Hold 'em? The group states that a "general goal of this AI research is to learn how to handle computational problems involving uncertainty and imperfect information." However, they do add that a "specific goal is to eventually produce a poker program that is stronger than all human players." This week's poker competition also recalls IBM's "Deep Blue" chess-playing program that famously defeated world champion Garry Kasparov (amid some controversy) in 1997. However, unlike chess or checkers, poker is a game of incomplete information, thus presenting a different, more difficult problem for researchers to tackle. "The difference is that chess is a game of perfect knowledge, meaning there is nothing hidden from the players," says Schaeffer. "In poker you can't see your opponent's hand and you don't know what cards will be dealt. This makes poker a much harder challenge for computer scientists from an artificial intelligence perspective." Will Polaris stand up to its human competitors? Schaeffer thinks so. Like humans, Polaris "learns, adapts, and exploits the weaknesses of any opponent." "The new program that will play against Phil and Ali should be considerably stronger than previous bots," says Schaeffer. "At the very least, we don't think it will embarrass itself terribly." The sessions are scheduled for noon and 6 p.m. (PDT) on Monday and Tuesday. Live updates of the matches will be posted at the U of Alberta website (cs.ualberta.ca). Complete hand histories will be made available at the site afterwards as well.